I was never interested in shooting portraits, or so I thought! Standing still, on the sidelines, as columns of brilliantly dressed Ladakhis walked by to the Polo Grounds for the Opening Ceremony of the Ladakh Festival, I watched. The multitude of tourists and photographers clamouring to capture everything. It stuck me. I was just a shy mouse. Embarrassed though I was, I did make a not-so-successful attempt at clicking the performers as they made their way to the Ladakh Festival. So, over the week as I journeyed through these Himalayan lands, I tried to remedy this. I overcame my natural inhibitions & clicked portraits of the kids I became friendly with. & seeing their eager smiles as they hugged my camera close and stuck their noses to the screen gave me more satisfaction than anything else on this trip!! 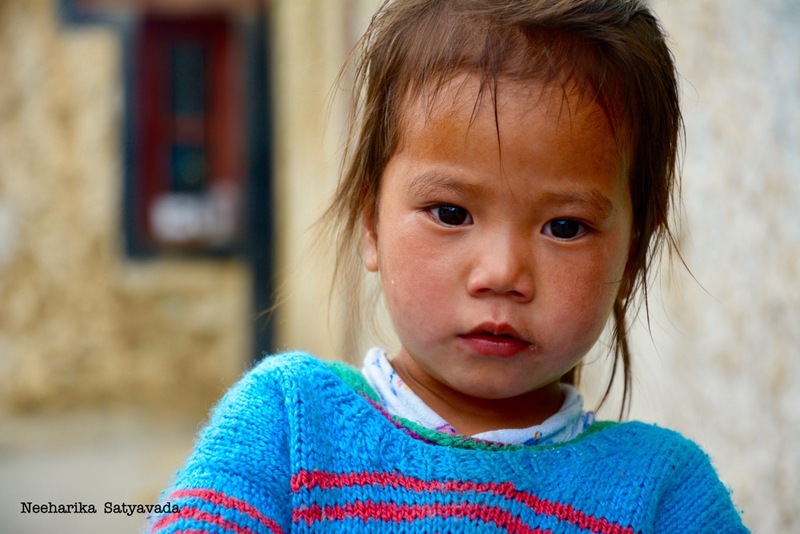 This little girl was the perfect model & gave me the confidence to pursue travel portraits of the Little Ones of Ladakh. Which is why this is my favourite picture & therefore the first in this series. I clicked this picture in Leh, as these little boys waited for their dad to take them to the Ladakh Festival. & this little baby girl here, at the opening ceremony, watching the performances from the protective lap of her grandmother. Again a conflicting picture, where the older of the two gets very conscious as she tries to pose for the camera, on the way back from school in Thiksey. To end this post, a photo of the most adorable baby boy I have ever seen, excited to be clicked as he stumbles across to the grocery downhill from Shey Palace. Did you have to overcome some fear or reserve on your travels? Do tell me. Would love to get any ideas on how I can take better photos in my further travels! Read Next: Ladakh Festival: Celebrating Life & Beyond. Great pictures! Capture the essence of childhood so succintly! Fantastic work Neeharika! Very impressive. As good as anything we have seen in the National Geographic. Lovely photos! I find portraits super challenging to get. I guess I am a little more shy than I care to be. Well done! So colourfully dressed…..and one can see the innocence in their eyes!! Wonderful pics !! Looking forward to more! !